Most of the members of the 2010 5A State Champion Baseball Cardinal team were at the high school Monday morning (June 28, 2010) to get sized for their championship rings and to receive their individual mini-trophy replicas of the big State Championship trophy that will remain the the school's trophy case. Coach Tony Reeder explained the design and options on the proposed state rings to the players. Behind Reeder is Art Smalygo (an assistant baseball coach) who will (again) become head volleyball coach with a camp starting in July. 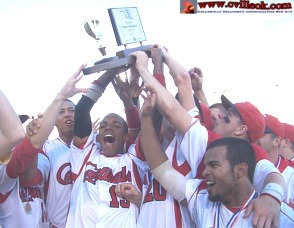 The CHS Cardinal baseball coaches also received individual trophies. Each player had their ring size measured by the ring salesman Monday. The Cardinals hoisted the big trophy after beating Booker T. Washington in the 5A State Finals May 17th at OneOk field in Tulsa. Their season record was 31-6 in bringing the first ever boys team state title to Collinsville.